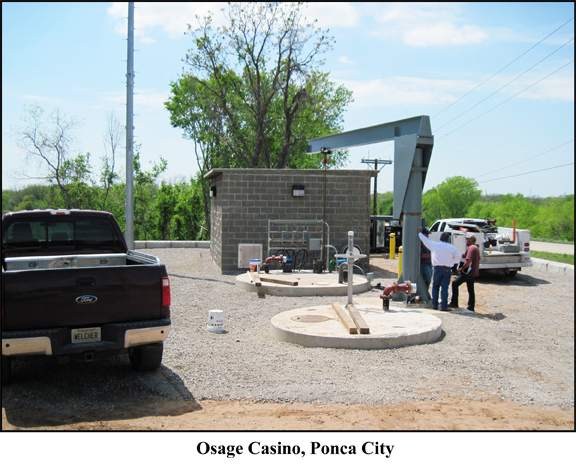 CGA Engineers was retained by the Osage Million Dollar Elm Casino, Ponca City - Osage Nation to investigate infrastructure improvements for the expansion of the casino. The scope included investigating the options for water supply, stormwater handling, and wastewater removal. The investigation and research process showed there was adequate water supply to the site. Further stormwater runoff could be managed by onsite detention ponds. However, the wastewater removal presented challenges. CGA Engineers investigated three options to address the wastewater removal. They were onsite lagoons, lateral fields, and the construction of a sanitary sewer main extension. The lagoon and lateral field options proved too land intensive and not feasible with the site. CGA studied the viability of a sanitary sewer main extension. The closes sanitary sewer line to the site was over a mile away and across the Arkansas River and part of the Ponca City Municipal system. CGA first contacted the City of Ponca City to see if they were interested and able to handle the waste. After favorable results of this meeting, CGA proceeded to prepare conceptual designs for the sanitary sewer. Three alternate alignments were investigated including a gravity line, and line attached to the Arkansas River Bridge and a line bored under the Arkansas River. Conceptual plans and cost estimates were prepared for the three alternates and included in a report. The most cost effective alternative was to attach the line to the Arkansas River Bridge. Including a new lift station, the estimated cost of this work was $1.4 million dollars.